For most of us, buckling up when driving and using sidewalks for a stroll are automatic safety habits. But did you know there is another real – and potentially life-threatening – hazard to drivers and pedestrians? I’m talking about the danger we don’t often consider: driving or walking near train tracks. Federal government statistics show that about every three hours in the U.S., a vehicle or person is hit by a train. To raise awareness of the need for caution near tracks and trains, the first U.S. Rail Safety Week will take place this year from September 24-30. While vehicle-train collisions in the U.S. have dropped by 83 percent in the last four decades, there are still more than 2,000 vehicle-train collisions annually across the U.S., and last year saw more than 900 injuries and fatalities to people walking, playing or taking photos on train tracks. These incidents are devastating to families, communities and train crew members – and they are often preventable. Remember, making the right decisions near railroad tracks can truly be the difference between life and death, today – and every day. 1) Look and listen for a train as you approach all railroad crossings - obey all signs, warning lights and gates. 2) Trains are quieter and faster than you think - never try to beat a train. 3) Because of their size and weight, it can take a mile or more to stop a train. 4) Always expect a train on any track; avoid distractions when you approach a crossing. 5) Railroad property is private property. Walking on the tracks is illegal and dangerous. 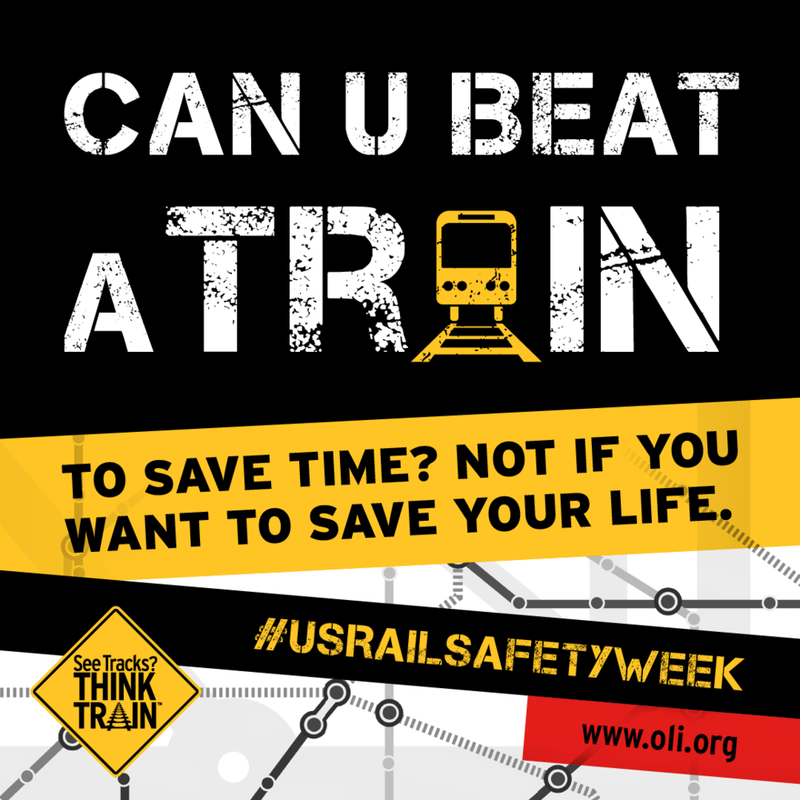 U.S. Rail Safety Week is spearheaded by Operation Lifesaver, Inc. (OLI), the national rail safety education nonprofit, working in partnership with the U.S. Department of Transportation, law enforcement agencies, and many other organizations.